So far, I've been super lucky to not have any chaffing with my long runs. 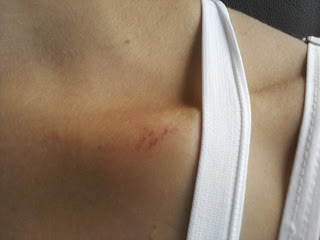 Last week I did have a little rubbing on my collarbone area from my camelbak. I didn't even feel it, just happened to notice it in the mirror the day after our run! Yesterday I did something silly. I wore different shorts. I usually wear my Nike tempos, but for some reason I put on my New Balance shorts. Although, it could have been the pad I was wearing too (I had just started my period 1st thing in the morning). Sorry about the TMI. When I was in the shower, I noticed a little burning in the "area" and sure enough, I had some chaffing going on there. Ugh. Not a lot. I didn't feel a thing during the run and I don't feel it at all today. Perhaps it is time to try out some anti-chaffing glides/lotions. Have you used any? What do you recommend? i had the same thing happen to me... had chafing under my arms from my camelbak, from my shorts in that lovely area, and... a first... from my ipod shuffle on my shorts line. weird! i have a great anti chafing stick but i dont have it with me right now. ill let you know when i get home what the brand is. great job on your 20 miles! Ouch. Glad it feels better now. I was just thinking this morning about using something for my chub-rub zone (I haven't before so I can't suggest anything). ouch on the chaffing! Isn't there something called Glide that is supposed to help? I have read about glide and some other ones - I just want to use something that has had good reviews from other runners! Thanks girls! There's Vaseline, moo glide..... Are you wearing a new bra? That happened to me. Ugh. Stinks!!! I tried Body Glide, but didn't like it. I tried it on my thighs though, and probably didn't put enough on. I think I would say give it a try (maybe the one meant just for women??) and use more of it than you think you need. I was hoping for more of a slick feel, but it was more of tacky feel.